Personality:Pervy, funny, lot's of energy, but can be serious, and romantic, because he writes romantic novels. History: During his youth Jiraiya found Myouboku mountain, the home of the toads. The elder sage toad forsaw Jiraiya's coming and offerd another prophecy. Which outcome the world faced would be decided by Jiraiya alone. 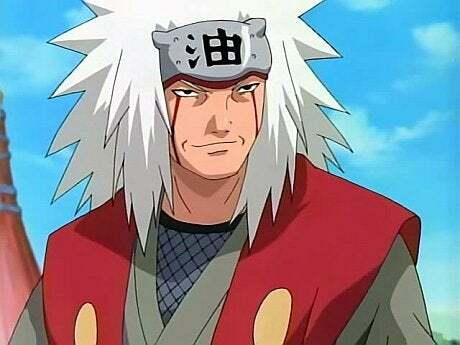 Jiraiya later fought in a war with Rain alongside Tsunade and Orochimaru. Jiraiya learned one boy, Nagato, held the Rinnegan, a legendary Doujutsu. Jiraiya connected with Nagato and left things in his hands when their training ended. Jiraiya returned to Konoha and acted as the trusted village soldier until he discovered Orochimaru’s crimes against his own village. Orochimaru escaped, perhaps leaving Jiraiya a wiser man for it. Some time after, possibly because of the Orochimaru incident, Jiraiya parted ways as a ninja with his home village. Over the years, Jiraiya observed them carefully, even after Orochimaru left their ranks. Jiraiya then agreed to help him instead, after Naruto bribed him by appealing to his lechery. It was during the training of helping Naruto develop chakra control that Jiraiya noticed the seal on Naruto’s stomach had been given an imbalance, Orochimaru’s work. Figuring out who Naruto was from the seal, Jiraiya trained Naruto to put the Kyuubi’s dormant chakra to use, helping Naruto understand more about himself. Jiraiya’s training with Naruto continued as he taught him how to summon animals as aid. Jiraiya was a master of toads, showing Naruto his skill by summoning one as tall as himself before his eyes. Naruto followed Jiraiya’s orders and signed a contract with the toads in blood, then tried out his new move. Naruto only managed to summon a tiny, useless tadpole. Jiraiya then realized it would take drastic measures to help him learn. Jiraiya sent Naruto tumbling off a cliff to a fatal fall. To Naruto’s surprise, he had called the ruler over all summoned toads, Gamabunta. Jiraiya, after fulfilling his promise to Naruto to train him, disappeared again for a while. Naruto initially refused, wanting to learn the Chidori like Sasuke. Along the way, Jiraiya also remarked that in a way, Naruto resembled the fourth Hokage. Naruto ran in headfirst to stop them, forcing Jiraiya to pull his trump card. Jiraiya, once Gai was out of earshot, told Naruto he would forbid him to wear it. Jiraiya told him that during the search, he’ll be concentrating more on Naruto’s training. Naruto popped the jumpsuit out again, but Jiraiya refuses to allow him to wear it. Later, Naruto found Jiraiya sitting in a fancy bar, accompanied by a pair of girls, drunk and with Naruto’s empty wallet on the table. As Naruto and Jiraiya left, Jiraiya bought the remainder of the water balloons and gave them to Naruto, telling him that the move he just used will require extremely difficult chakra control. Bit by bit, Jiraiya helped Naruto to learn it, also marking his hand as a focal point. Eventually, Jiraiya traced Tsunade to the direction of Tanzaku Castle. Tsunade had already gone ahead and turned on Orochimaru by the time Jiraiya caught up with them, bringing Shizune, Naruto and Ton-Ton with him. Naruto was surprised to see Kabuto alongside Orochimaru, where Jiraiya pointed out Kabuto’s allegiance was on his forehead protector, now bearing the Hidden Sound logo. Jiraiya then told Shizune to keep an eye on Kabuto as he went after Orochimaru directly. It wasn’t until Orochimaru noticed Naruto’s use of the Rasengan that Jiraiya slipped up, having fended off Orochimaru’s direct attacks with his unusual body by turning his hair into spiny projections. Jiraiya set him straight that it was a battle against Orochimaru. The entire ordeal left Jiraiya with a broken rib and leg. Needless to say, the incident put both Naruto and Jiraiya off venturing back there without further information. Soon enough the time came and Naruto and Jiraiya left Konoha behind and officially started on their training journey. During the time that passed, Jiraiya continued his novel series as well as his research into Akatsuki, Orochimaru and now with Naruto by his side, the Kyuubi. Concerned for Naruto’s phenomenon of Kyuubi manifestation, where the Kyuubi appeared around Naruto as a fox-shaped aura of bubbling red chakra, Jiraiya developed a patch that would neutralize it when placed on Naruto. This deadly berserk Naruto managed to strike Jiraiya causing a large scar to develop on his chest. After three years, Naruto and Jiraiya finally returned to the village. Jiraiya returned Naruto to Kakashi's care and as a precaution, he supplied the suppression patch to Kakashi in case Naruto ran wild. Jiraiya warned the group of the danger Naruto posed when he lost control to the fox aura, showing him the large scar he received from Naruto's four-tailed form. Jiraiya then moved to summon Naruto's "Key", a sealing scroll which controlled the Kyuubi seal. Jiraiya asked that the scroll be given to Naruto in case he didn't return and then he set out again. As Jiraiya and Pain began to battle, Jiraiya was forced to call on the toad sages to assist in battle. This mode increased Jiraiya's power and gave him a more toad-like appearance. Out of nowhere Jiraiya was struck by another Rinnegan user. Jiraiya retreated inside the stomach of a summoned toad. Jiraiya was then shocked to recognize his opponent. Ma toad left, leaving Jiraiya and Pa Toad to investigate. Jiraiya then thought over Naruto's drive and refusal to give up. Jiraiya willed himself back to life to Pain's and Pa Toad's surprise. Jiraiya realized Naruto was the actual child of destiny, and left his final message concerning Pain's true nature to him. Jiraiya left things in Naruto's hands and was then hit by another attack from Pain. Jiraiya disappeared into the depths, having given his life for Naruto and the safety of his home village Konoha. Jiraiya really wasn’t dead. He just fainted. He was later revived by a group of wanderers that went scuba diving.